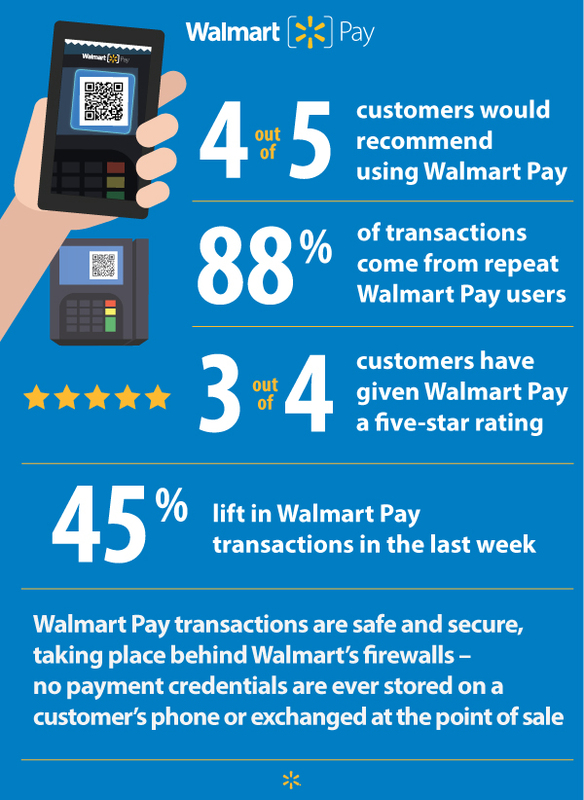 Bentonville, Ark., July 6, 2016 – Today, Walmart announced that Walmart Pay, a safe, easy and convenient way for customers to check out with their smartphones, is now available in the more than 4,600 Walmart stores nationwide. Available through the Walmart app, Walmart Pay works with any iOS or Android device*, at any checkout lane, and with any credit, debit, pre-paid or Walmart gift card. Walmart Pay is like no other mobile payments solution available today, expanding access to mobile payments and improving the way customers check out in all Walmart stores in the U.S.
Walmart Pay is one of the newest and most powerful additions to the Walmart app, which ranks among the top three retail apps in the Apple and Google app stores with more than 20 million active users. The app was built with an emphasis on making shopping faster and easier for customers – from refilling a pharmacy prescription to building a gift registry and finding where an item is located in store. The app also makes it easy for customers to shop the millions of items on Walmart.com. Wal-Mart Stores, Inc. (NYSE: WMT) helps people around the world save money and live better – anytime and anywhere – in retail stores, online, and through their mobile devices. Each week, nearly 260 million customers and members visit our 11,527 stores under 63 banners in 28 countries and e-commerce websites in 11 countries. With fiscal year 2016 revenue of $482 billion, Walmart employs more than 2.3 million associates worldwide. Walmart continues to be a leader in sustainability, corporate philanthropy and employment opportunity. Additional information about Walmart can be found by visiting http://corporate.walmart.com on Facebook at http://facebook.com/walmart and on Twitter at http://twitter.com/walmart. Online merchandise sales are available at http://www.walmart.com and http://www.samsclub.com. *Available on any phone that can download the Walmart app.